So much evidence is pointing to the fact that humans were not designed to breathe, absorb, ingest oil and petrochemicals. Petrochemicals and their byproducts, such as dioxin, are known to cause an array of serious health problems, including cancers and endocrine disruption. “American Fuel & Petrochemical Manufacturers is the new name of the National Petrochemical & Refiners Association, an organization with a proud 110-year history of serving America. AFPM is the new NPRA. We adopted our new name in January 2012 to better describe who we are and what we do. “You come into contact with chemicals every day. This is called chemical exposure. Although some chemical exposures are safe, others are not. A certain amount of a harmful chemical must enter your body to make you sick. Harmful chemicals can get into your body if you breathe, eat, or drink them or if they are absorbed through your skin. 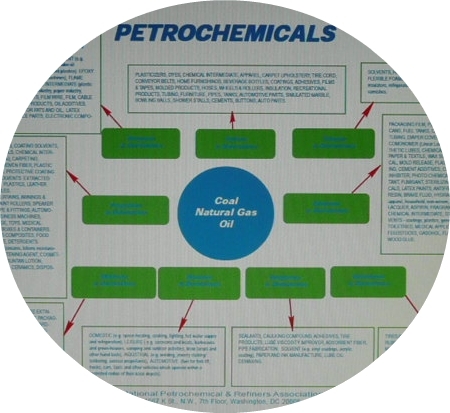 This booklet explains some links between chemicals and other harmful substances and their possible health effects. People respond to chemical exposures in different ways. Some people may come into contact with a chemical and never be harmed. Others may be more sensitive and get sick. Sometimes illness happens only if you are exposed to a harmful substance for a long time…. So while not everyone is aware of how petrochemicals are messing with our health, almost everyone does know someone with cancer, asthma, autism and other “environmentally” influenced conditions who could immediately benefit from a serious reduction in personal care and laundry product pollution, especially fragranced products. Research these days tends to focus on finding a problem and then adding another petrochemical pharmaceutical as a “treatment” instead of then looking for the cause(s) of the problem to eliminate the cause(s), thereby creating even more complex problems that we’ll never be able to solve. Let’s take better care of our environment, ourselves and each other. Let’s practice the precautionary principle. Let’s leave this planet inhabitable for future generations. Petrochemical pollution IS a problem. Let’s stop buying all the junk and toxic products and use safe, non-toxic products and materials that don’t pollute the environment and ourselves. This entry was posted in Chemicals, Environment, Health, Pollution and tagged Chemicals, fragrance chemicals, health, science. Bookmark the permalink. Here’s hoping that the day will soon be here when the Petrochemical pollutions will be far better controlled so that no more life is harmed. I wish more health care providers were aware of this issue. In my experience, so many doctor offices, hospitals, etc. could stand to address this issue and become more accessible to people with chemical sensitivities. In the meantime, all health care providers should ban fragrances, just like they’ve banned smoking! It’s really a no-brainer with the information we have now. LInda, agree with the ban of fragrances! I have sensitivites and become toxic quickly. It was discovered when I was working in the oil and gas industry Of couse, I was neve able to get a difinitive answer and unable to gain any help with my medical expenses or losses from inability to work. It has been a struggle to say the least. The denial and obfuscation has been massive. Are you aware of the recent series from the Center For Public Integrity? It discusses how industry hides relevant research, and hires people to keep the harms from becoming public and from having to pay out compensation to those who are injured. It’s not just a conspiracy theory… it’s happening and there’s a lot of evidence coming out now on how they have been doing it. Here’s hoping that something will shift soon to help us live without the constant struggle to survive in a toxic world when we no longer tolerate the exposures.